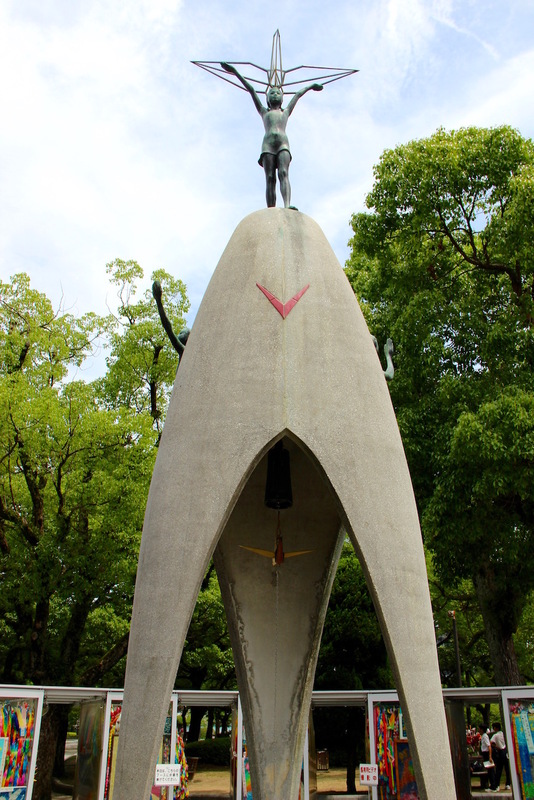 Today, August 6th, 2018, is the 73rd anniversary of the atomic bombing of Hiroshima by the United States. The white concrete ceiling supported by horizontally-running exposed redwood beams soars at least two stories above the heads of about 150 seated attendees at Sunday’s gathering at the Green Gulch Zen Center in Mill Valley. Something about the way the ceiling meets the walls to articulate the cleanest of 90-degree angles catches my attention. The woman at the front of the room wears short grey hair, a hairpin attached to a coiled fern, and dark linen clothing. The square-shaped cloth bib she has draped around her neck is mimicked throughout the audience of mostly white Zen practitioners and visitors sitting on meditation cushions around the outside of the room and folding chairs through its middle. The speaker tells us that she’s wearing the fern so that she doesn’t take herself too seriously, which can be a terminal disease. She goes on to tell the story of Sadako and the 1000 Paper Cranes. 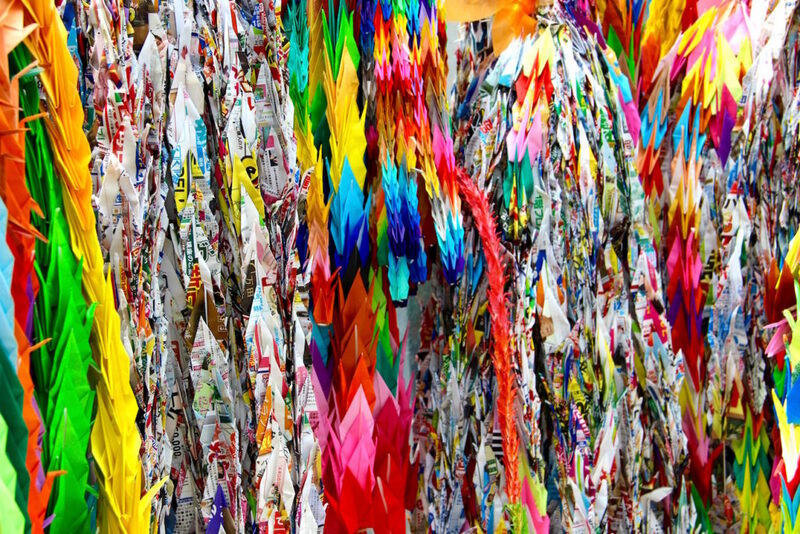 A 2-year-old resident of Hiroshima when the United States dropped the atomic bomb, Sadako became a symbol of peace in Japan and throughout the world through her commitment to fold 1000 paper cranes in the hopes of surviving the leukemia that took her life at age 12. The speaker continues to talk about the bombings of Hiroshima and Nagasaki through tales of those who rose from the ashes. She ends discussing the need for man and nature to come back into harmony. The acute and pervasive suffering in today’s world she attributes to man’s lack of relationship with the natural world. She closes talking about the 100+ trees that survived the bombing, one in particular in the epicenter that came back to life after years of being dormant and tended to by tree experts. I notice unfamiliarity with ever being in a room of people where the bombing of Hiroshima is being talked about. And, I notice that this story lives somewhere in my cells. I think for a moment about the impact of this mass trauma in the ways that aren’t necessarily visible, measured or noticed. As the session comes to a close, we file out of the Zendo to the courtyard that smells of freshly baked goods. A long table boasts a beautiful array of muffins and breads for sale. Another bursts with fresh greens – kale, swiss chard, lettuces from the Center’s garden. Lines of people waiting for tea form. There is chatter and light laughter as the people gather. I sit on a rock in the sun watching the people in service – pouring the tea, selling the bread and vegetables. I remember the people who served in the church I used to attend and how similar the macro view of these two places of spiritual seeking and study are, yet how different their practitioners might distinguish them to be. I am struck by the human desire to be in service of the greater good. My heart breaks open a bit, sitting on this rock in a sunny crevasse in this lush green Mill Valley ravine.